Garmin nuvi 660T includes full UK and European street-level navigation and integrated FM traffic receiver. The Garmin nuvi 660 provides alerts about traffic, road construction and weather-related tie ups. The Garmin nuvi 660T uses data to suggest alternate routes before you encounter problems. The Garmin nuvi 660T also provides audio entertainment and hands-free mobile phone calls. Garmin nuvi 660T has been discontinued. Accessories, spares and parts are still available for your nuvi 660T, as are the road maps. Garmin nuvi 660T lets you play your favourite MP3s and audio books while on the go, making traveling anywhere even more fun. MP3 and audio sounds are automatically paused by navigational voice prompts so you can enjoy your favourite MP3s and never have to worry about missing a street or turn. The Garmin Nuvi 660T includes integrated FM traffic receiver and you avoid the traffic tie-ups by simply pushing a button to calculate a new route. Garmin Nuvi 660T integrate wireless technology with a microphone and speaker that lets you make hands-free mobile phone calls. Simply dial numbers with the Nuvi's touch screen keypad to make a call on compatible phones with Bluetooth wireless technology. To answer calls, just tap Nuvi's screen and speak directly into its built-in microphone. In addition, easily look up and dial numbers from your personalized phone book or from your phone's call history log. Don't know the phone number for your destination? Simply find and dial it from Garmin Nuvi's extensive points of interest database - including hotels, restaurants, stores and attractions. The Garmin nuvi 660T also includes the ability to use Garmin nuvi Travel Guides which provides you with helpful and thorough reviews and recommendations for restaurants, hotels, shopping, nightlife, sporting events and tourist attractions. Several versions of Garmin Travel Guides are available for Europe and the United States. Garmin Travel Guides are available on a selection of SD cards. The Garmin nuvi 660T has been designed to be plug and play, and as such can be transferred from vehicle to vehicle with ease. The Garmin nuvi 660T is powered with the 12-volt vehicle power adaptor and attaches to your vehicles windscreen via the Garmin nuvi 660T suction cup bracket. Alternatively with the dashboard disk you can mount the suction cup bracket on your dashboard instead, all three accessories are supplied with the Garmin nuvi 660T. The Garmin nuvi 660T can also alert you to UK and European speed camera locations, the data which is supplied from Cyclops is updated weekly, so you always have access to the most up-to-date information. Subscription to the Cyclops UK speed camera database is priced at £39.00 for 1 year. The Garmin nuvi 660T is preloaded with City Navigator® NT for United Kingdom and Republic of Ireland provided by Navteq. Navteq maps provide high quality detailed street level maps, which in addition to street information include features such as route calculation, Points of Interest (POI), Estimated Time of Arrival, and more. Further Garmin nuvi 660T maps are available SD card which insert directly into the Garmin nuvi 660T. Available Garmin nuvi 660T maps include, France, Spain, Germany, Italy, Western Europe and North America. View the complete range of maps available for the Garmin nuvi 660T. Looking for accessories and spares for the Garmin nuvi 660T? View the full range. All parts are genuine Garmin product and specifically designed for use with the nuvi 660T. Accessories available to purchase include a 4.3-inch black carrying case, mains power charger, a weighted dashboard mount and external GPS antenna. Along with these accessories, it's also possible to buy replacement parts such as windscreen suction cup mount and vehicle power charger. View all of the nuvi 660T accessories here. 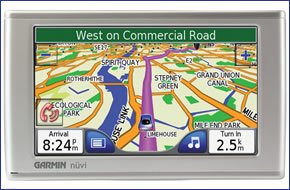 Looking for sat nav maps for the Garmin nuvi 660T view them all here. All mapping comes on microSD card with SD card adaptor and is genuine Garmin product and specifically designed for use with the nuvi 660T. Areas available to buy include: Southern Africa and Middle East and Northern Africa. Question: I have two Garmin Nuvi 660FM which I use regularly. I know they are quite old but very good satnavs. Would the latest Garmin City Navigator Maps UK and Ireland be compatible? If not could you recommend an alternative map. Answer: Yes, the latest Garmin City Navigator Maps UK and Ireland are fully compatible with the Garmin nuvi 660FM. Due to the age of your device a free software/firmware update would be strongly recommended before you insert the new map on the SD card. Read more information about installing Garmin maps. Question: I have a Garmin nuvi 660 owned from new. How much to a) update UK maps only and b) have traffic alerts? How much to a) update UK maps only: £34.84 + delivery by buying Garmin City Navigator UK and Ireland SD card. and b) have traffic alerts: To receive traffic alerts you need to buy and use the Garmin GTM 21, however this cable was discontinued by Garmin 5+ years ago we sold out many years ago. Do you have a question about the Garmin nuvi 660T? Submit your question via our contact page.